Hawaiian Airlines only recently started acquiring airplanes (A330-200) that are capable of that range. According to Wikipedia, London and Paris routes were discussed. My speculation is that buying a landing slot for London or Paris at the moment is too expensive for them. Busy airports in Europe don't have enough slots for everyone. Airlines end up trading those slots. Simply, because no airline has determined the route makes economic sense. Some passengers already travel between London and Hawaii, through connecting flights. A non-stop flight might cause more people to fly this route, but it would also cannibalize existing business from the connecting flights, meaning you'd need to get further customers to make up the difference. LHR-HNL is about 7,200 miles. As you note, this should be within the capabilities of long-range aircraft, but we'd still be talking about a flight on the order of 16 hours. This is quite the distance. Would enough passengers want to travel this long between the cities? To put it another way, are passengers willing to travel that long also willing to endure a bit longer of a journey by making it a connecting flight? The airline operating the route needs aircraft capable of such long flights. If they don't already operate a suitable aircraft, they need to acquire some and train pilots and mechanics and ground staff, an operation that takes years and hundreds of millions of dollars. Hawaii is generally considered a leisure destination, and it's generally a fairly expensive one at that. Londoners have access to lots of rather inexpensive flights on low-cost-carriers to beach resorts within at most a few hours flying time. Many are in low cost of living countries where accommodation is fairly cheap. Tenerife, Greece, Southern Spain, Mallorca, Cyprus, and a number of Eastern European destinations are all rather accessible, and operators frequently offer packaged trips. Such destinations may not be exactly the same as all the splendor of Hawaii, but they're much cheaper and don't require 16 hour flights to get there. Will the route be popular with business travelers? Keeping such a service profitable is far easier if you have a regular stream of business travelers between the two cities, especially if they're willing to pay for premium cabins and last-minute bookings. Ultra-longhaul flights without a large supply of business travelers just don't work. Landing slots at Heathrow, the most logical place for such a flight due to its connections, are in very short supply and thus quite valuable. This further increases costs. Ultra-longhaul flights work best when they're connected with an extensive route network, so they can receive feeder passengers from and carry passengers to other connecting flights. That's why they generally serve major airline hubs. Honolulu, because of its location, isn't an ideal high-density hub. Its main links are to other Hawaiian and Pacific islands, along with the US West Coast and East Asia, generally to cities that are already served by direct flights to London. As such, adding such a flight would not be that useful in helping an airline build its network. In addition, if Hawaiian were to operate the route, it would need to develop partnerships with European airlines to build a route network there (so as to facilitate booking, of say, HNL-LHR-CDG), a process that could involve lengthy and expensive negotiations. Is there significant air cargo demand? A very profitable cargo route may help make up for lower passenger demand, but is there a lot of demand to ship cargo between the two cities? The amount of cargo payload you can take also depends on the aircraft you choose. Some aircraft do have the range to make the flight, but would have payload restrictions, which reduces profitability. Larger aircraft may have more capacity, but may be harder to fill. Also, according to this forum post, a service was operated in the early 80s (with a fuel stop), and it was rather unpopular and thus unprofitable. All that said, ultimately, all we can do is speculate. Airlines study potential routes extensively, but they don't release their internal numbers. If one thought it made economic sense, they would introduce the new service. Hawaiian Airlines simply doesn't have any aircraft that can operate the flight. For now, Hawaiian Airlines does not consider its A330-200s to have sufficient range to reach London with the desired payloads and it's not yet sure whether its upcoming A330neos will be able to, either. Flights to London are a goal but may be at the limit of what’s attainable after the carrier swapped its order for Airbus Group SE A350-800 jets to the shorter-range A330neo in 2014, Hawaiian Holdings Inc. CEO Mark Dunkerley said in an interview Wednesday. Note from the above quote that Hawaiian has replaced the A350 order mentioned in another answer with an order for A330neos instead, so it currently has no A350s on order. One interesting note from that same interview is that Hawaiian is also looking at possibly acquiring some of the cheap A380s currently floating around on the market. However, it's considering these for its current high-demand markets such as Los Angeles, Las Vegas, and Tokyo, not expansion to Europe. Dunkerley, 52, said the airline is looking seriously at whether the Airbus A380 might have a role to play within its network, especially on routes such as those from Honolulu to Los Angeles, Tokyo and Las Vegas, which it serves with smaller wide-body planes six, three and two times daily respectively. The argument for using the superjumbo, which might be available on attractive terms either from Airbus or, soon, in the second-hand market, isn’t conclusive and Hawaiian needs convincing of the business case, Dunkerley said. The main problem overall with direct flights between Europe and Hawaii (on any airline) is what Zach mentioned in his answer: It's an ultra-long-haul leisure route. It's very hard to make the numbers work for such a route, as airlines typically rely on selling expensive close-in-booking and premium-cabin tickets to business travelers as well as relying on them to keep load factors up in order to turn a profit for their ultra-long-haul routes. This route would also be competing with several existing single-stop routes with connections in New York, Chicago, Atlanta, Denver, Los Angeles, Seattle, etc. These routes are already economically feasible due to the much higher demand for traffic to London from these connecting points (and other cities feeding to them) than from Hawaii. Similarly, demand from the U.S. mainland to Hawaii is much higher than from Europe to Hawaii, so those existing flights remain viable. With that said, there are recent rumors regarding the Swiss leisure-route-focused airline Edelweiss possibly starting a route to Hawaii from Zurich soon using A340-300s, but this is presently still unconfirmed. The economics of this seem pretty sketchy, though, and the "as early as December 2016" start date mentioned seems even more sketchy. Not the answer you're looking for? Browse other questions tagged airline-operations usa flight-path uk long-haul or ask your own question. Why is on-time performance important for commercial flights? 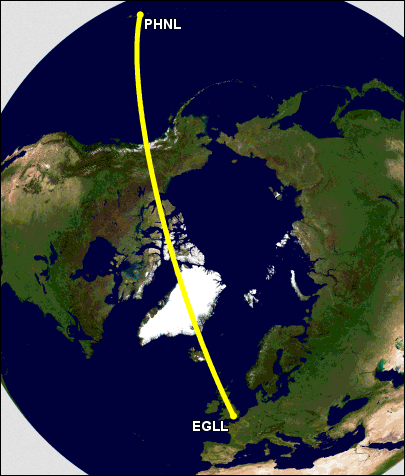 Does ATC direct flights to fly eastbound at odd levels and westbound at even ones? Why flights route is so different? Why do airlines not use direct routes? Why is Iceland an efficient connection point between London and Boston/NYC?